What a difference a year makes. It was only 12 months ago we made the trip to Morley College for the final game of the season, rooted to the bottom of the league and desperately in need of a win to avoid picking up the League’s wooden spoon. I’m pleased to say this season has brought happier times; buoyed by an intake of enthusiastic new players, we’ve more than held our own in the division and I’m pleased to have a different problem – deciding who to pick or leave out when we’re oversubscribed for games. Whilst the backdrop is different, I’m delighted to confirm our match result appears to be heading the same direction! We triumphed last season, and we look set to do the same this time round, leading 4-2 with two games scheduled for adjournments. Robin’s match remains in the balance but mine looks pretty positive (Fritz has it +10.0!). The match itself was pretty, well… odd. We started with a default; their board 8 was a no-show. We played our games under near constant chatter from the walk-ins and late arrivals. And then we ended the evening by being kicked out of the building by security whilst several games were still going. Fine if it’s a slow play, but mine was Quick and designed to finish on the evening. Bizarre! Under the circumstances, I confess I didn’t get to see much of the other games, so then just a word of acknowledgement to our winners. John got back into winning ways with a great result on Board 2. 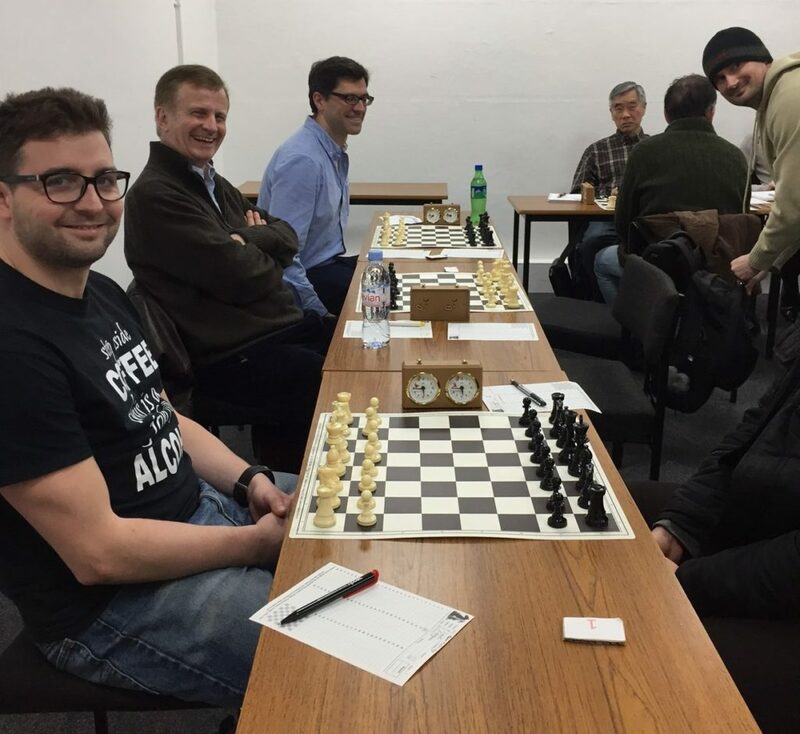 He appeared to be being edged in the middle game but the position was fairly complicated, and a series of quick-fire errors meant before long his opponent’s Queen was no more. That was the end of that. Rich ground down his opponent with heavy pressure pivoting around a pawn on the 7th, drawing a broad smile from his opponent when the hammer finally fell. I think he knew he was done long ago but battled on bravely for the sake of his team. Fair play. The final victor of the night was David Pearson, who calmly chalked up his first win in Division 4. Very well done. I asked Adam what had happened and he was equally perplexed having watched some of it – “I don’t know. It seemed to be pretty even with loads of pieces on the board and then bang… a few moves later he’d won”. You’ll have to show us that trick next time around, David. Worth sharing! The great week for Hammer seems to be extending into a fortnight! Long may it continue. Previous Previous post: Hammer v GM Chris Ward – pt. deux! Next Next post: Royal Bloodshed!